If you’re reading the posts on this site, you’ll know already about “The Clapp Block”, which was built by Edwin Ruthven Clapp (1827-1907) who was my 2nd Great Grandfather. E.R. 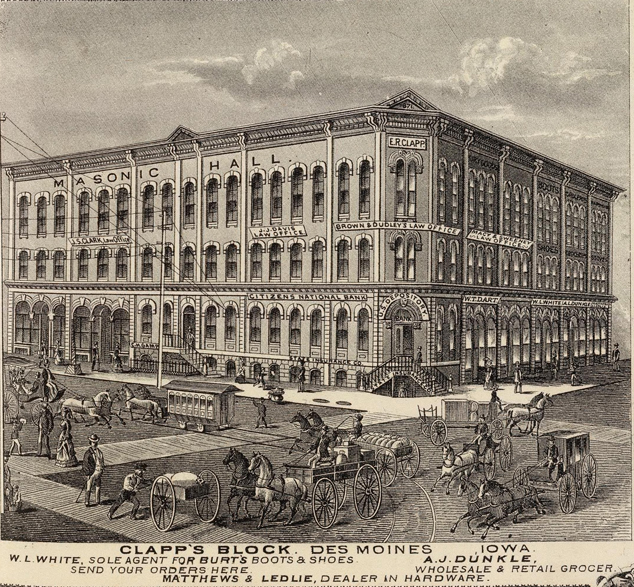 Clapp, as he was known, built the impressive office building known as The Clapp Block in 1873. Just before he built this building, he was a widower and about to re-marry. “before that event he desired to make certain gifts to his children, one of whom had married A.M. Forster,” So in 1871 he gave each of his three daughters a piece of land next to the property where the Clapp Block would stand. When he did that, he instructed them that they should leave an agreed space, 48 feet wide and 66ft long, vacant or as a courtyard, between the Clapp block and any buildings the daughters might construct. This was to leave light and air for the windows which opened on that side of the The Clapp Block building. One of E.R. Clapp’s daughters was Helen Margaret Clapp. She married Aaron Milton Forster. I don’t have a record of the marriage date, however their son Edwin William Forster was born on September 2, 1870. We might presume that the marriage was at least 9 months prior, perhaps right at the end of 1869, when Helen was 18 years old. We have a hint that Helen’s father E.R. Clapp, did not like his new son-in-law very much. Helen’s new Husband A.M. Forster was 26 years old at that time. He had been a soldier in the Civil War, serving as a private in Company H, Iowa 23rd Infantry Regiment. 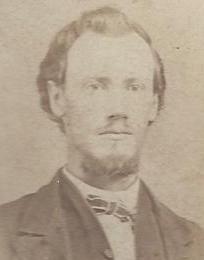 He mustered in on 29 Aug 1862.Mustered out on 26 Jul 1865 at Harrisburg, TX. Note that 1070 men served in the regiment. 79 were killed in action and 209 died of disease. 26% of those who joined the regiment, did not come home. 4 years after the war, at the time of their marriage Aaron was a 26 year old carpenter and a contractor. It’s clear that Helen’s husband A.M. Forster, erected a building on that Helen had received from her father. He grandly named the new building: “The Forster Block”. 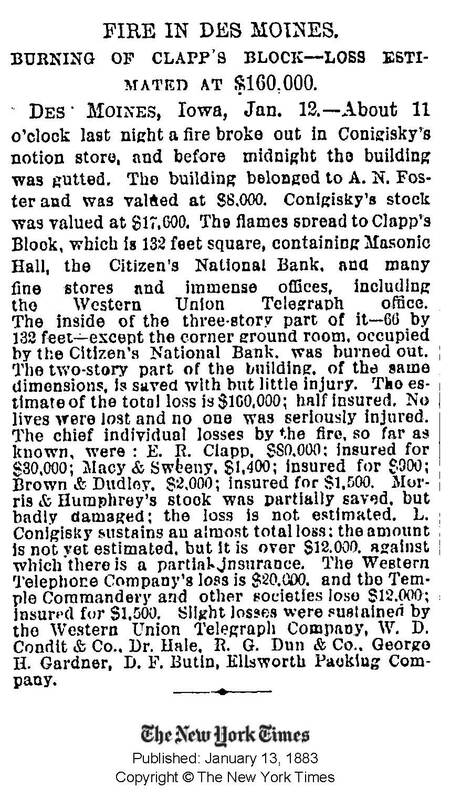 As far as I can determine, “The Forster Block” was a 22 foot wide structure at 504 West Walnut, Des Moines. The Clapp Block building next door was 66 x 132 feet and 3 stories high. Helen died on December 21, 1879. According to legal records, she “died intestate” and her husband Aaron inherited 1/3 of the property. 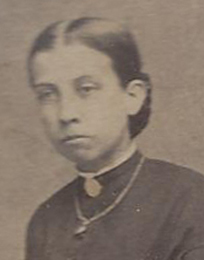 Her son Edwin William, then 9 years old, inherited the remaining 2/3. In 1883 Aaron’s son Edwin William Forster, the majority owner of The Forster Block, would have been 13 years old. So decisions about the building would have been made by his father Aaron. Aaron excavated the entire property for the new building, ignoring the 48 foot by 66 foot easement, which was recorded in a document both he and Helen had signed. A newly constructed building of that size would have obstructed windows and openings in The Clapp Block and prevented access to get coal to the steam heating plant in the basement as well. We can imagine that E.R. Clapp, Aaron’s father-in-law, was not pleased. While we can also imagine that he asked Aaron verbally to cease that construction . . . that seems not to have caused the construction to stop. The records we have show that E. R. Clapp sued his son-in-law with the intent to have him stop that planned construction and to not build on the 48 x 66 easement. E. R. Clapp, a prominent business man, real estate developer and banker, won that court case and the verdict was later affirmed by the Iowa Supreme Court.